FM Productions (with Hunt Industries) is bringing another killer show to Springfield. 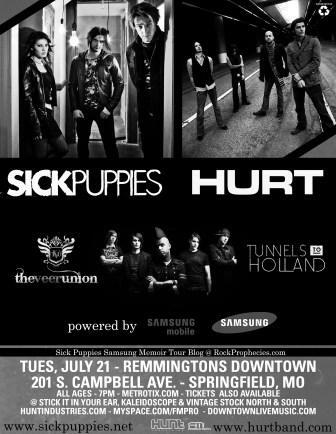 This time its Sick Puppies coming in with Hurt, TheVeerUnion, and Tunnels to Holland. Sick Puppies is touring in support of their upcoming release, “Tri-Polar,” due out July 17 (just days before the show). Their latest single, “You’re Going Down,” is all over radio. Details on the show inside.